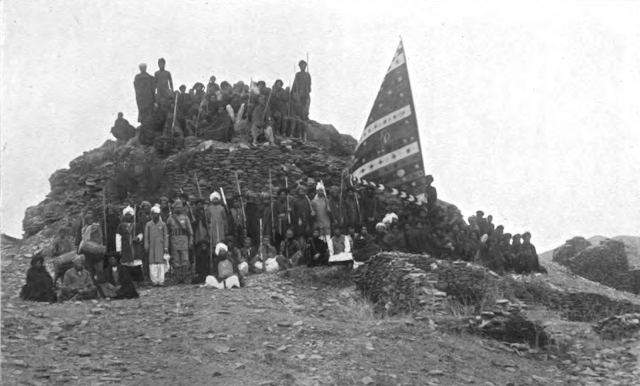 A group of Mashwanis, taken amid the ruins of Sirikot fort (Haripur), c.1907. Mashwani had nine sons, Tukuz, Lodin, Matakati, Suleiman, Roghani, Kazbuli, Ghareb, Kharbari, and Diaz. The first Pashtun poet, the historicity of whose person and work, we can not reasonably doubt, is Shaikh Isa Mashwani. He was contemporary of Sher Shah Sur. Shaikh Isa seems to have settled in India. Naimatullah Haravi in his 'Makhzan-i-Afghani', mentions Shaikh Isa among the Afghan saints, and attributes to him the authorship of a "Risalah" (book or treatise) written on the unity of the divine being in three languages i.e Pashto, Persian and Hindavi viz Hindi or Hindustani, and produces a few specimens of his verses in these languages. It was reported to Sher Shah that Shaikh Isa was addicted to wine and did not deserve to be treated as a pious man. Sher Shah got angry and deputed a spy to investigate the fact. Fortunately, the Shaikh succeeded in impressing the state spy by his saintliness and the latter in his turn changed his royal master's adverse opinion about the saint.